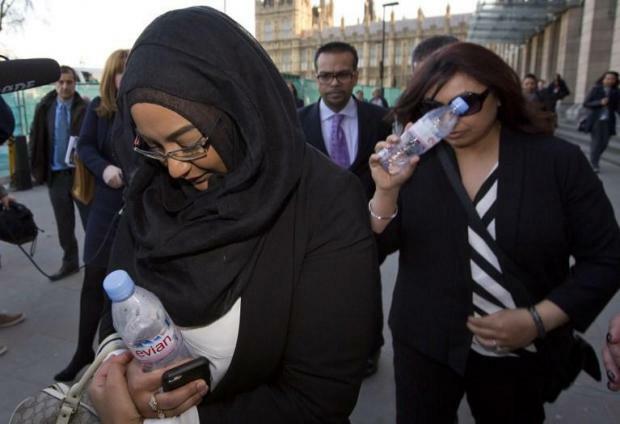 Sahima Begum (left), older sister of Shamima Begum, as she was leaving the House of Commons in 2015 after giving evidence on the background and details leading to the disappearance of Shamima, who fled her London home for the conflict in Syria. Shamima Begum, now 19, expressed no regrets about fleeing her London life four years ago but said that two of her children had died and, pregnant with her third, she wanted to return. She left the jihadists as they staged their last stand in Baghouz in eastern Syria, near the Iraqi border. "I was weak. I could not endure the suffering and hardship that staying on the battlefield involved," she told the newspaper from the Al-Hawl camp. She described life under IS with her Dutch husband, who surrendered as they left, telling The Times: "Mostly it was normal life in Raqqa, every now and then bombing and stuff. "But when I saw my first severed head in a bin it didn't faze me at all. It was from a captured fighter seized on the battlefield, an enemy of Islam. "I thought only of what he would have done to a Muslim woman if he had the chance." She added: "I'm not the same silly little 15-year-old schoolgirl who ran away from Bethnal Green four years ago. And I don't regret coming here." Begum was one of three schoolgirls from the same school in the east London district of Bethnal Green who ran away to join the IS group in 2015. Another girl from the same area left the year before. One of the girls, Kadiza Sultana, has been reported killed and Begum said the other two, Sharmeena Begum -- no relation -- and Amira Abase stayed on in Baghouz. "They were strong. I respect their decision," Begum said of her friends. "They urged patience and endurance in the caliphate and chose to stay behind in Baghouz. They would be ashamed of me if they survived the bombing and battle to learn that I had left." She added: "They made their choice as single women. For their husbands were already dead." Begum said she was nine months pregnant, and her two previous children had died - a daughter, Sarayah, who was ill, and a son, Jerah, whose death was linked to malnutrition. "In the end, I just could not endure any more," she said of her desire to get out. "I just couldn't take it."